As part of SCA’s strategic plan to collaborate and partner with corporations in our community, SCA hosted a hospital roundtable which united local medical professionals with SCA teachers and medical-bound secondary students. The group was able to discuss hiring practices and create mutually beneficial collaborations and opportunities for SCA students. 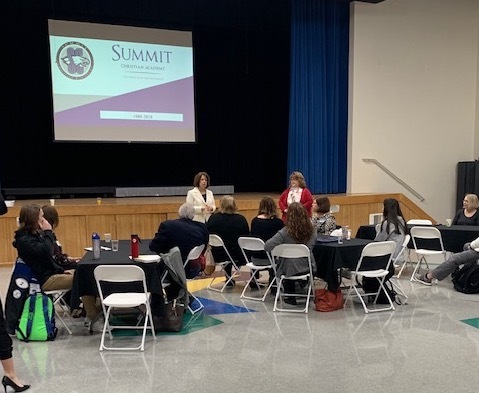 Summit Christian Academy (SCA) was pleased to collaborate with Jessica Hamilton of Lee’s Summit Economic Development Council to partner and host local medical professionals at a hosted roundtable breakfast recently. Human Resource representatives from John Knox Village, Children’s Mercy, Truman Medical Center, and Lee’s Summit Medical Center joined with SCA Business teacher Elaine Whitfield, Science teachers Diane Ferguson and Tim Schwab, and four medical-bound secondary students. The group had break-out sessions discussing the medical fields’ biggest hiring needs, internship practices, and what they wish high schools taught students. SCA already has one teacher planning a field trip to Truman’s Medical Explorers and another benefiting from the speakers bureau of Children’s Mercy as a result of the roundtable.